Want to find out more about UKRRIN and our Centre of Excellence in Digital Systems (CEDS)? Join us on Tuesday 9th April from 15:00 for the second event in our lecture series focused on the topic of ‘Digitising the Railway’. We will also hear from our Keynote speaker Stuart Calvert, Interim Managing Director, Group Digital Railway, Network Rail. 16:00-17:00 – Lab tours and refreshments. Professor Clive Roberts will give an overview of the Centre, its capabilities and future research activities. 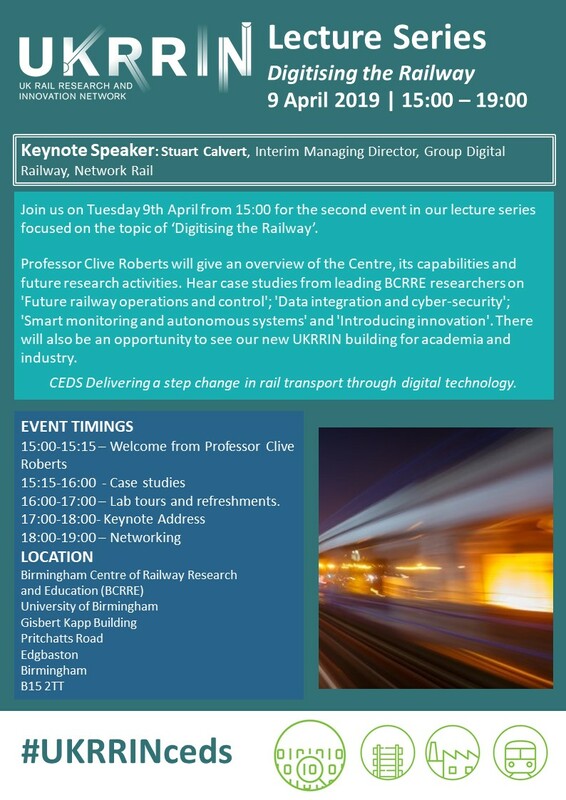 Hear case studies from leading BCRRE researchers on ‘Future railway operations and control’; ‘Data integration and cyber-security’; ‘Smart monitoring and autonomous systems’ and ‘Introducing innovation’. There will also be an opportunity to see our new UKRRIN building for academia and industry. The Centre of Excellence in Digital Systems (CEDS) aims to meet the current and future demands of the GB rail industry for research and innovation in new areas, supporting transformational change in rail technology across the globe. The Centre will link with other centres in the UKRRIN Network to deliver a step change in rail systems capability. The event will be hosted by the Birmingham Centre for Railway Research and Education (BCRRE) at the University of Birmingham, please do reserve your place now as we anticipate high demand. Find the event flyer here.